Locust Pose or Salabhasana is a powerful backbend performed while lying on the stomach. This posture strengthens the back, stretches the anterior spine, opens the heart, and helps the practitioner overcome fear. Modifications for this pose can make it more comfortable, or can also take it to the advanced level for a deeper backbend. Practiced with integrity, this posture has many health benefits to the yogi. After your Locust, take a moment to rest on your abdomen with your head turned to the side and your eyes closed. Lying face down with your forehead on the mat, extend your arms out in front and your feet long behind you. Take a full Inhale and exhale. On the next inhalation, lift both arms and legs as high as possible, squeezing from the lower, middle, and upper back. Roll the shoulders down and back, keeping the neck in a neutral position (gaze slightly in front of you), and hold for three to five abdominal breaths. Balance on the pelvis, keeping the arms by the ears and the feet together. Exhale, slowly release, and repeat. Lying on your stomach with your forehead on the mat, place your arms straight behind your back, palms together and fingers interlaced. Zip up the feet, knees, and thighs. Take a full inhale and exhale. On the next inhalation, lift up your legs, head, and chest as high as possible. Keep your hands clasped, arms and wrists straight, rolling the shoulders down and back. Take the gaze upward to slightly extend the head and neck. Exhale, slowly release, and repeat. Lying with your face down and your forehead on the mat, work your arms under your body, clasping the hands together, your thumbs next to each other and facing down. Straighten the arms, positioning the forearms and elbows under your body. Bring your chin to the mat, and take a full inhale and exhale. On the next inhalation, lift the legs as high as possible, countering the contraction by pushing your hands and forearms into the mat. The legs can be parallel, hip distance apart, or (more advanced) zipped up together. From the Traditional Locust position, bend the knees and lower the feet as close to head as possible as you lift your torso from the ground, tailbone pointed forward. The knees are parted here, and the feet may touch the head. Stay here for a few breaths. Unclasp your hands here and press your palms down to the ground if you wish. As you come out of the pose, releasing the contraction of the back slowly, use arm resistance to control yourself down to the mat. This posture massages the digestive tract, opens the heart, strengthens the back, and lengthens the spine. It can be followed by a simple Child’s Pose as a counter posture to open the sacrum and relieve the posterior compression of the vertebrae. 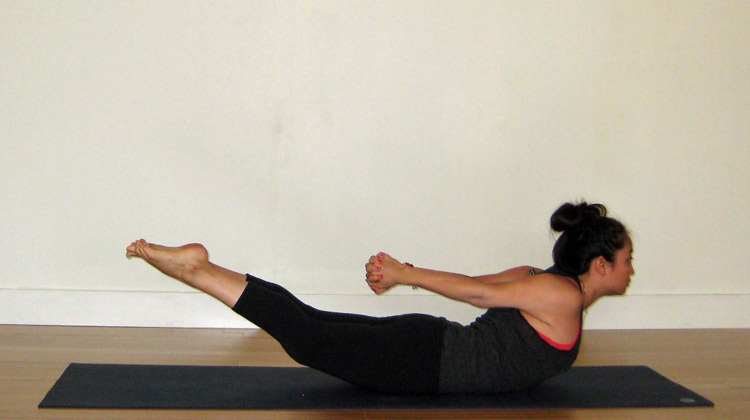 So, which of these Locust Pose variations can you do the best? Share your experiences and thoughts in the comments below!